Due to DKWien’s successful bid to host the European Universities’ Debating Championships in Vienna (Vienna EUDC), necessary organisational activities reached a level that could not be adequately administered by DKWien, legally or otherwise. As a result, we undertook several steps recently, to adapt its operations. Some of these steps made the organisation easier; others were mainly a legal necessity. Here are some potential questions and answers that should help provide some transparency. DKWien founded a daughter cooperation, named Debattierklub Wien GmbH, in the legal form of an Austrian Limited Liability Company. As the company is owned by DKWien, this mainly a change in the legal structure. The organisational oversight remains with DKWien members. Yet, the activities undertaken by the company are structured more clearly by organisation than before. Accounting and decision making for Vienna EUDC are now formally separated from the DKWien board. What does the company do and why was a company necessary? There are three reasons why founding the company was the best option. A) DKWien started entering into a long term project with an external partner by September 2014. Since the partnership has commercial character, it could not be conducted under the not-for-profit structure of DKWien. B) At the same time, previously unpaid activities by DKWien, especially in schools debating, became more extensive and are slowly developing a stronger commercial element. Again, this would be problematic under the previous structure. 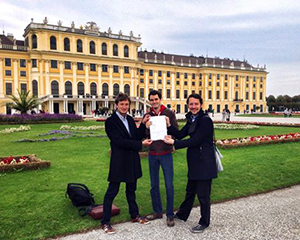 Stefan Zweiker and Jakob Reiter formally run the company and report to DKWien which owns 100% of the shares. The board of DKWien is responsible for the supervision of Jakob and Stefan. Internally Regina Puthenpurayil and Karoline Lutz will take over the financial oversight at Debattierklub Wien GmbH. What does the company provide for Vienna EUDC? Clear financial oversight: The GmbH takes over many of the contracts and transactions for Vienna EUDC. For all these, the strict accounting and billing requirements of Austrian law apply, as they do for any major business. The reports are checked by a tax consultant. This is significantly more transparent than under the more lenient requirements for NPOs. Insurance for partners and volunteers: As most business are not used to contracting with an NPO, a GmbH is an assuring factor for them. The legal construct entails a certain minimum capital and a strict, publicly visible liability structure. Moreover, the GmbH will employ our volunteers. Hence, they will be insured against accidents during the Vienna EUDC event and are entitled to a volunteer statement. A different tax structure: The main difference in the new legal structure lies in taxation. The NPO/Verein structure would have caused a legal uncertainty, as taxation would very much have depended on the interpretation of the law. Large events like these are rarely carried out by NPOs. Consequently, there is no reliable precedent on how taxation needs to be handled, which results in the risk that the authorities would not necessarily provide an interpretation that would be beneficial for the organisers. Similar problems have already occurred with Amsterdam EUDC and Berlin WUDC. With the company, our tax-load might end up being marginally higher. However, we can take this cost into calculation well before the event. Overall, this enhances our planning security. The foundation of the GmbH will incur costs that will stay below 7 000 EUR in the upcoming two years. It is not cheap but the revenue generated by projects made possible through the foundation will be significantly higher than the cost incurred. Therefore, the GmbH is a financial net benefit for Vienna EUDC and DKWien. Administrating the GmbH is substantially more work for Stefan, Jakob, Regina and certain other members of DKWien. However, we decided that the benefits we expect are worth the extra effort. What happens to the company after Vienna EUDC is over? (5) keep its not-for-profit character in its main fields of activity. Thanks to Fletch and Damita for correction and many useful comments.